Orkut has just added a new feature called Photo tagging. This Feature allows you to tag the photographs of other users and is kind of a bookmarking service where the tagged photos would be visible onto the Profile page. This is another feature added to Orkut in a last few days after Country specific domains and Themes for Orkut. The Photo Tagging Feature allows you to Tag photo graphs of other users and the Tagged Photos will be visible on the users Orkut Profile page nest to the Fan count under the name of Photos of Me. You can see the option to tag any photograph at lower right of any photo. You can disable or enable Photo Tagging Feature by going to the settings Panel. So when you disable it no one can tag your photos. To tag a Photo Just Click on Add Tag link on the bottom and Select the part of the Photo you wish to tag. 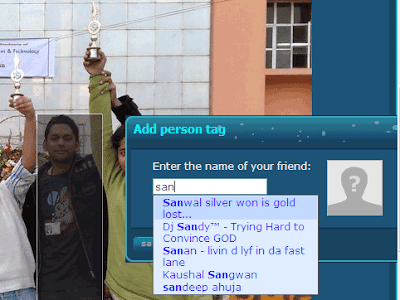 After selection a Text field pop ups and you can specify the Name of you friend in t to tag it. It is a good feature and along with Tagging you can always comment on photographs.